On August 17th, 2011, The Royal Canadian Mint (RCM) announced that it will be releasing a new one-ounce 99.99% pure silver bullion coin. 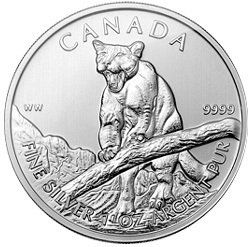 The 2012-dated “Cougar” silver bullion coin, with a $5 face value, is the third in a series of six coins celebrating Canada’s Wildlife; only one million coins will be minted. The obverse will feature the Susanna Blunt effigy of Her Majesty Queen Elizabeth II, and the reverse design is the work of Senior Mint Engraver William Woodruff. The designs were unveiled to an audience of coin collectors and bullion distributors at the 2011 World’s Fair of Money, held by the American Numismatic Association in Chicago, Illinois. The two previous releases in the Canadian Wildlife silver bullion coin series featured the wolf and the girzzly. Three additional coins will be produced for the series; one more coin in 2012, and two in 2013. The RCM does not sell its bullion coins to the public. It only sells the coins to bullion distributors around the world, who have the necessary business infrastructure to manage daily real-time buying and selling of bullion. The RCM is the Crown Corporation responsible for the minting and distribution of Canada’s circulation coins. An ISO 9001-2008 certified company, the Mint is recognized as one of the largest and most versatile mints in the world, offering a wide range of specialized, high quality coinage products and related services on an international scale. Any idea when the coins will be released? I think the Grizzlies came out in April or May, so perhaps six months after that, or around October or November? September 2011.” — from the press release. Thanks, Les. And thanks for the heads up on this issue.